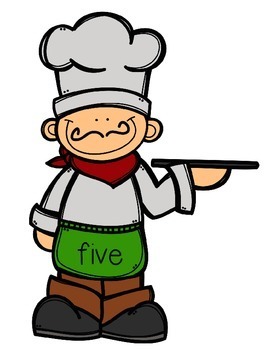 In this center, students will match the number word on the chef’s apron to the number of pepperonis on the pizza. 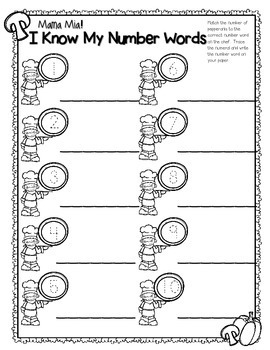 Students will then trace the number and write the number word on their recording sheet (optional). 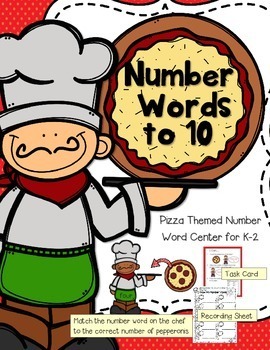 Print out the 10 chefs, the 10 pepperoni pizzas, and task card on heavy paper. Laminate and cut out. Print out a recording sheet for each child. You may also put the recording sheet inside a pocket protector and students can trace the number and write the number word using dry erase markers. 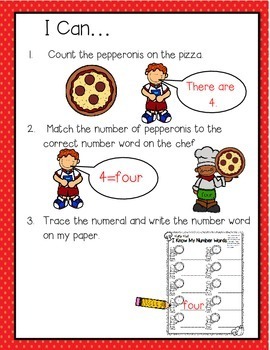 Students will count the pepperonis on the pizza and match it to the correct number word on the chef’s apron. Students will then trace the number and write the number word on their recording sheet.